Raven Society Award at the University of Virginia in support of his creative writing. But it wasn’t until two decades later, after completing a three-year isolated meditation and yoga retreat in the high-desert mountains of Arizona, that James felt compelled to publish stories that allow readers to experience deep wisdom gained from his fifteen years of detailed Buddhist and yoga training. Following in the footsteps of his story-telling idols C.S. Lewis, Neil Gaiman, and the Wachowskis, James is a firm believer in combining philosophy with fun. He is the founder of GoBeyond.org and travels teaching Buddhist and yoga philosophy with an emphasis on meditation. He is also a blogger for The Huffington Post. I only have one rule when it comes to writing. I ask myself, “Is this a story that will this help someone?” People are so busy; their lives are so precious. Before I write anything I really think through whether this will bring value to a reader’s life. Will they be happy they read this story? Is their life enriched by the hours they gave me as a reader? When I think of the reader first, the words come. I spend as much time planning the character arcs, plot points, and individual scenes as I do writing. In planning, I constantly push myself to discover the fresh twist or fresh telling. With each page I want readers to experience something they haven’t before. With each scene I outline: 1) What needs to be accomplished to propel the story forward. 2) What’s the most visual or cinematic way to dramatize it. 3) What’s the fresh twist. I need to be clear on those three elements to write fresh chapters. I play through the detailed scene outline of the entire work before writing. It may take months or even years to create the perfect structure for a story, but then the story flows. I know what to foreshadow and what to emphasize at every point. Then the writing supports the story. My main task as a writer is to never let the writing get in the way of the story. I think readers ultimately recall their experience of the story and the emotions they felt more than individual words. I work hard on the craft of writing. And for me this is mainly a discipline of prioritizing story and character over phrasing. Definitely. 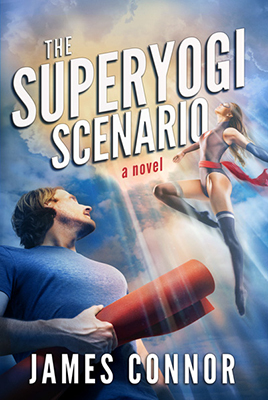 A funny thing happened in writing The Superyogi Scenario. The heroes and villains came to life in such vivid detail that they started to talk to me about my writing. They always got their way and the novel is better for it. Mostly, start in an unusual place. Tell a story that only you can tell. If that means you need to investigate further to make it real, do so. Then write. Then you’ll discover something to say that can help people. When I came out of a three-year meditation retreat in 2014, the publishing world had changed. There’s probably never been a better time to be an independent publisher. I had a story I really believed in and didn’t want to wait two years to share it with the world through the big publishing channels. I also had the instinct that people were looking for more meaningful entertainment. So I started an independent publishing company, Sky Grove, to publish not just my novels but also mainstream novels from people who had significant wisdom to share. I’m looking forward to releasing The Training of Kara Steele by Kristin Walsh. It’s a laugh out loud story of one woman’s quest to learn how to love without getting in the way. She also completed a three-year isolated meditation retreat and has wonderful wisdom to share. I concentrated on getting the right partners: a big distributor and a great printer. Then I followed the best practice of sending advance reader’s copies to major reviewers four months before publication. Based on the strength of reviews, printing, distribution, and marketing plan we had no problem getting Barnes and Noble to order hardcovers. Of course, Amazon is great distribution platform for ebooks. With all their marketing programs I chose to give them the ebook exclusive from the start. There’s been so much push for the globalization of book publishing that I think the pendulum will naturally swing back. I’m thinking locally a lot more. How can I connect with readers at live book events and live book talks? It’s fun to put the computer down from time to time and connect with readers in person. I’ve found those kinds of book sales are meaningful and motivating. I have a clearer picture of who I’m writing for and often those people are the ones who really champion your book.